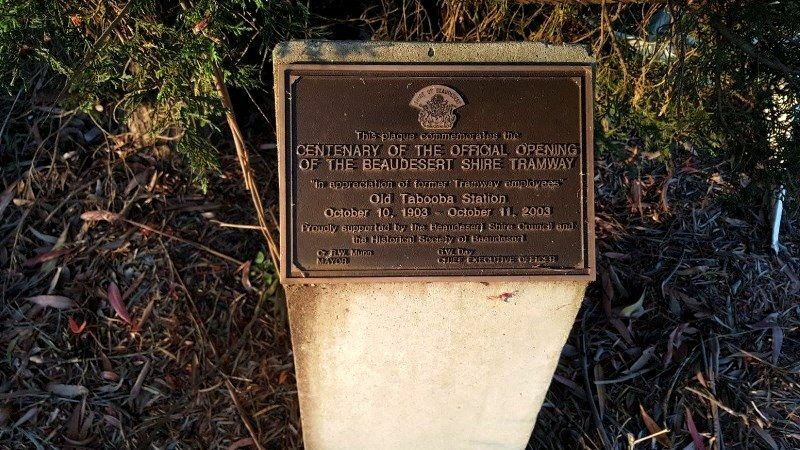 A monument commemorates the centenary of the official opening of the Beaudesert Shire Tramway at the Tabooba Tramway Station in 1903 and is in appreciation of former tramway employees. A nearby plaque gives details of the Tabooba Station and staff. The Beaudesert Shire Tramway was a narrow gauge tramway which operated from Beaudesert to Lamington and Rathdowney in Queensland. It was one of 15 light railways built and operated by Divisional Boards and Shire Councils in Queensland. The Tabragalba Divisional Board, predecessor of the Beaudesert Shire, proposed the construction of the Tramway in 1899. Approval was granted on 23 October 1901 and the Beaudesert Tramway Committee was formed on 3 March 1902. The Tramway opened from Beaudesert to Innisplain and Lilybank on 10 October 1903 with Sir Herbert Chermside, Governor of Queensland, officiating at the opening ceremony at Tabooba Junction. The line was extended to Lamington in October 1910. A branch line from Tabooba to Rathdowney was opened in March 1911. The total cost of construction was £92,770. The tramway closed in 1944 when road transport became more cost efficient. "In appreciation of former Tramway employees"
Joe Messinbird - Fireman, later Driver. Mrs. Messinbird - First Station Mistress.